Models 2907-TV, 6507TV, 7007-TV, and 9007-TV ranging in horsepower from 1/2 to 2, are the premium lift machines of the ADC line. Equipped with electronic frequency drives, these machines are the most versatile in the ADC line. Designed for lift applications, these machines offer a multitude of parameters that can be programmed in the field to meet a variety of applications. Parameters such as run speed, maximum obtainable speed, minimum obtainable speed, acceleration ramp time and deceleration ramp time are easily changed right at the drive. Each machine is provided with deceleration limit switches which allow the machine to decelerate to a stop rather than abruptly stop at the end of its travel. These machines also feature emergency over-travel limit switches and Fast-stop push buttons which bypass the deceleration ramp and shut the machine off immediately. The operation of these machines is Start/Stop/Reverse/Fast-Stop from any point of travel. Low voltage controls is standard on these machines. Each machine is supplied with a set of control buttons on the machine's control box as well as a remote control station. If versatility is a project requirement, this series of machines is the best option. Rotary Limit Switches for decel to full open decel to full closed positions as well as overtravel. Connects to 120 volt power supply Models 2907TV, 6507TV & 7007TV (230 volt, 3-phase is available as an option). Model 9007T available for use with 230 volt 3-phase power sources only. Must specify voltage when ordering. Curtain machines shall be fully automatic type equipped with ... HP motor, with magnetic friction brake, right angle gear reducer on the output drive shaft of which shall be mounted elevator-type grooved cable drum and outboard bearing to support and align extended shaft. 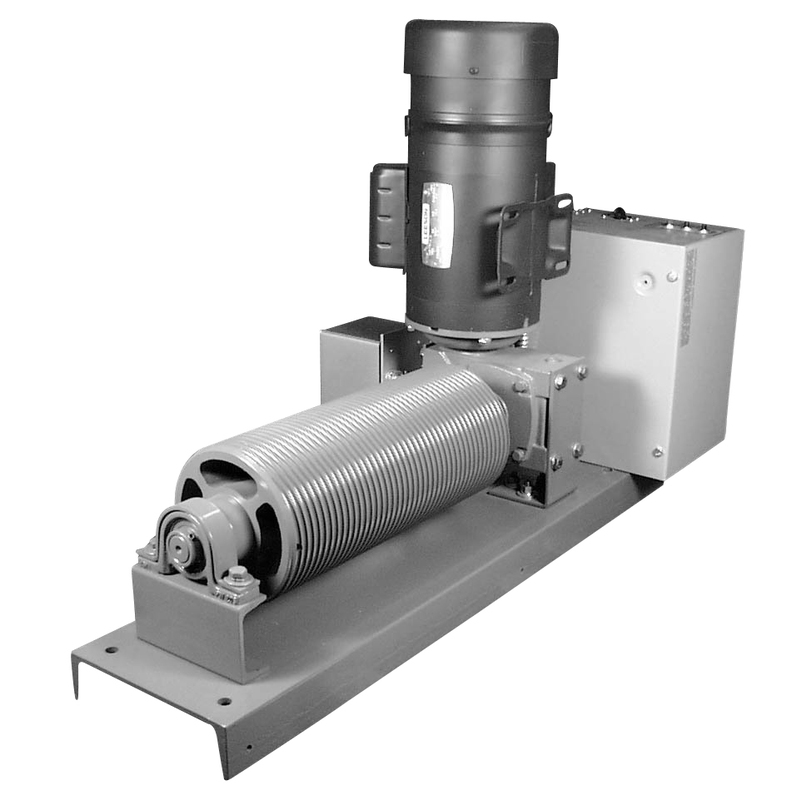 Drum shall deliver a variable cable speed of 0 to 54 feet per minute. Mechanism shall include electronic frequency drive to provide variable speed and reversing action at any point along the travel and shall include four-button (five if remote reset is required) control station mounted on unit and one for remote control. Control switch wiring shall be accomplished through low voltage system running from control box on machine to the remote control station. Integral rotary limit switch shall be driven from output shaft of gear reduction unit. Machine shall be equipped with disconnect switch, overload protective breaker and emergency hand crank for conversion to hand operation in the event of a loss of power. The entire mechanism shall be mounted on heavy steel base. Model ... as manufactured by Automatic Devices Company of Allentown, PA.